Tam, who is now a National People's Congress deputy, handled constitutional reform on three previous occasions. 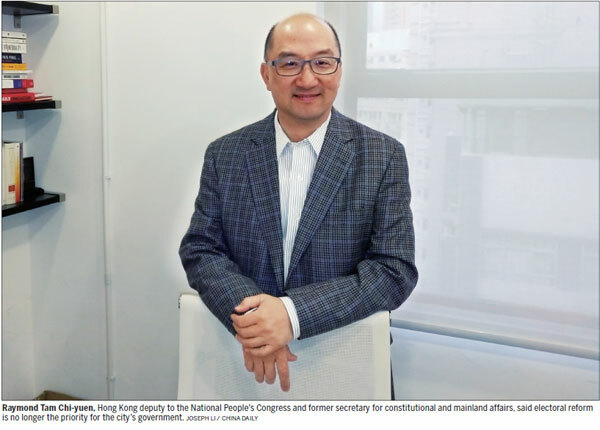 Recalling his most recent experience - during the government of former chief executive Leung Chun-ying in 2012-17 - Tam began preparatory work in the summer of 2013; a constitutional development task force was formed in October that year. "This is now April 2018," he said. "Unless a constitutional development task force is formed no later than the third quarter this year, there will not be enough time to handle this huge task," Tam said in an exclusive interview with China Daily. "Even though an electoral proposal to elect the chief executive by universal suffrage is carried, almost two years are needed for local legislation - that is to rewrite the main ordinance, amend the related ordinances and renew the voter-registration roster. "There is a slim chance to reopen the electoral reform within the current term of government. If a task force is not formed before 2018 third quarter, I can say the chance will be zero." At this point, Tam couldn't avoid criticizing the opposition lawmakers, who in 2015 defied overwhelming public opinion and vetoed the universal suffrage package for electing the CE by one-person-one-vote, which could have been introduced for last year's poll. Tam said this was the heaviest failure of his ministerial career. The electoral reform package, based on the constitutional framework the NPC Standing Committee set out in August 2014, would have let all eligible permanent residents of Hong Kong vote in the poll. Tam said it was in no way fake universal suffrage. "I wish I had the right to vote and choose the CE last year," he lamented. "The 'pan-democrats' acted wrongly to reject the electoral proposal. I don't know but I believe many of them regretted doing that," Tam said. "Since they had vetoed the proposal, another proposal would not come again so quickly and Hong Kong people may have to wait for another 10 years. "If the opposition lawmakers were willing to 'pocket it first' by carrying the 2017 package, improvements of the nomination procedure and the expansion of the voter base would definitely be made for 2022," Tam said. However, electoral reform is no longer the priority for Hong Kong's governance, Tam noted. 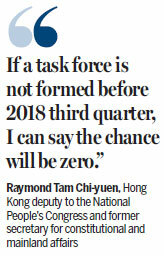 "I believe constitutional reform is not high on the agenda of the central government and Chief Executive Carrie Lam Cheng Yuet-ngor," Tam said. "And I agree with her that the special administrative region government should now focus on economy and people's livelihoods."